I've decided to log out of Twitter. I mean I won't be logging in for a while, except when I need to in order to retweet, check DMs, etc. I will keep "tweeting" via my social bookmark, but I won't be there; I won't be looking at twitter.com or twitter.com/nofrills. I won't check who retweets/favs my tweets. I won't see replies. In fact I've seldom seen twitter.com lately. I "tweet" via b.hatena.ne.jp (auto feed), open my page (twitter.com/nofrills) to view Trends, to check typos in my "tweets (feed)", and to add some extra notes onto my bookmark/tweet (see fig below). It worked fine. Until today. 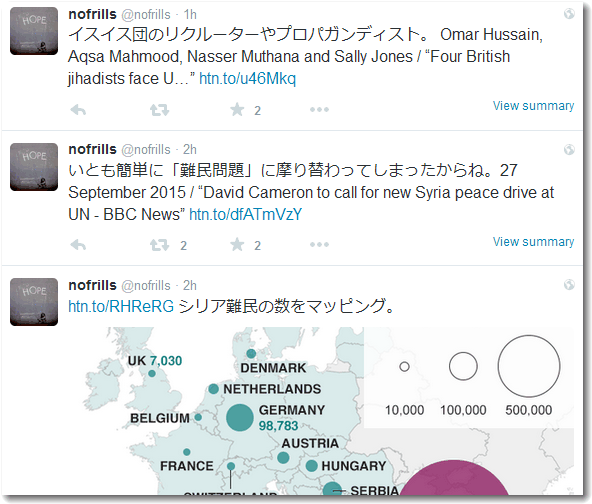 I was "tweeting" via b.hatena.ne.jp on Syria; the UNGA is currently on, which means there are a lot of news articles on Syria. Somebody posted a bilingual reply (in Japanese and English) to one of them. It's about Yemen, which is a different issue from Syria. Posting an unrelated reply is enough for me to block the user (see what happened a few weeks ago) but you just can't do that to news from Yemen, can you? No, that's not a problem, in this case. What bothered me was that the reply showed yet another horrific picture. Yes, dead bodies everywhere. Again. Such pictures no longer move me. They only make me feel sick. They only make me close the browser window. "Saudis are killing civilians," it said, as if I hadn't been aware of the atrocities brought on the Yemeni people KSA and its allies. I've been well aware of it. But what can I do? I'm only an individual. I'm not a news org like @BBCWorld or @guardian. I'm not a human rights NGO like @HRW or @Amnesty. Why do I have to be shown such horrific pictures personally, by a complete stranger on the Internet, when I myself am not prepared at all? All it does is just to put me off. Forcing individuals to know/see graphic pictures is not same as sending such pictures to the BBC, the Guardian or the New York Times. This is the ultimate limit of Twitter, IMHO. Twitter is not the "fourth estate" that is sometimes supposed to have power to bring about changes. Look at Syria. Look at Bahrain. With tons of tweets that showed the horrific reality of the oppression, nothing was sorted. Contrary to some popular utopian views, the "democratic" internet managed to do very little for the oppressed people. Of course it matters a lot that people have the freedom of speech. But let's face the music, the internet itself can't change the way in which a country is run, and/or the United Nations works. I've seen Bahraini pro-democracy movement (many of the activists speak English and are on Twitter) ignored by the "international community". 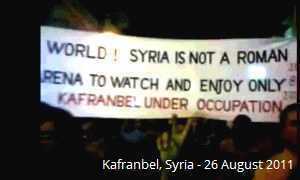 Syrian activists and their supporters were called terrorists or puppets. Even I was slugged as a "brainwashed, CNN-loving moron" because I tweeted and retweeted about the violence by the Assad regime. (BTW I seldom read CNN articles.) Even so, many including me have tried to "spread the word" and help them. Nothing. Nothing at all. Except for the confident smile on Putin's face, and handshakes between the US/UK leaders and the KSA regime. And here are new atrocities. Are we supposed to do the same? Are we going back to 2011? We on the internet basically let them down. The people in Syria and Bahrain who have wanted freedom (of speech, from oppression) have instead got tear gas, live rounds and bombs, and the internet couldn't stop it. More over, pictures of dead bodies have traumatised me really badly over the years. I'm not a type of person who can't look at graphic pictures, but I'm not a trained journalist. I don't have a counselor or therapist to rely on unless I personally pay the hefty fee. When you send me horrific pictures, you would be satisfied, feeling you've done something good. And who pays for my trauma? Do you even know me? I don't know you. Who are you to send me such images? I just can't handle graphic pictures any more after these four years. Enough is enough. Only on Twitter have I seen such horrific pictures. If I log out of Twitter, I'm basically free from those bloody images. And so, I haven't looked at twitter.com for a few months, and it worked fine, until today, when somebody posted an unrelated reply to my tweet that I looked at to post an additional note. Otherwise I wouldn't have checked that horrific reply.